Barleylands’ Chris Philpot has paid tribute to his ‘dedicated team’ after scooping a national Lifetime Achievement Award for his contribution to education at an awards ceremony held last week (Thursday 24 November). 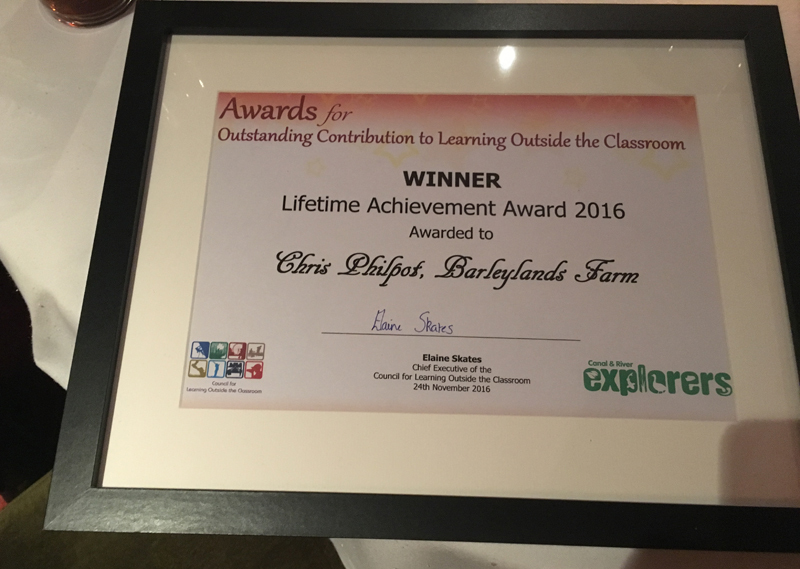 Chris was presented with this prestigious award for his work to ensure that young people have inspiring experiences outside the classroom. The Council for Learning Outside the Classroom’s awards honour individuals and teams who have made ‘a significant impact on the lives of children and young people through their commitment to providing and/or championing exciting and inspiring learning outside the classroom’. Learning outside the classroom plays an important role in helping young people to achieve their goals by providing hands-on practical experiences that bring learning to life. Whether this is through fieldwork, school activities such as forest schools, educational visits to museums, galleries, farm activity centres or cultural expeditions abroad, learning outside the classroom can build lasting, positive learning experiences. Chris Philpot has been running educational visits at Barleylands for over 30 years. He is passionate about educating children and has committed his career to engaging young people with farming and the countryside. In 1984, having grown up on the farm with his father collecting vintage farm machinery, he decided, along with the family, to create a farm museum where the equipment could be displayed with information to help visitors understand more about food and farming. The museum provided the catalyst for the development of the farm. Until the late 1990s, Chris would host school trips by himself. Today, Barleylands employs an education team, with all school visits run by experienced CEVAS trained staff, who share his enthusiasm for creating fun filled educational experiences and days out for 14,000 children every year. The farm museum, now called the Discovery Barn, provides a unique experience for schools and visitors where children can grind wheat, match seeds to food, make healthy lunchboxes, learn about food miles and sample milking methods from the past. From growing crops, vegetable plots, a polytunnel, farm animals and a purpose built kitchen classroom where children can cook from scratch during a visit, Chris has developed the farm over the years, adding a host of new experiences. Almost six thousand votes were received for this year’s awards.